Israel Folau will need to adjust to an unfamiliar position. 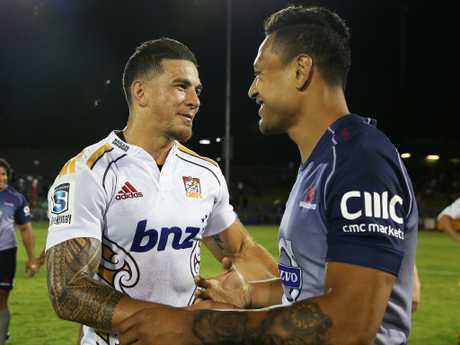 A RIVALRY that's spanned more than a decade, multiple code-hops and plenty of off-field theatre finally throws Sonny Bill Williams and Israel Folau together, face-to-face. Williams is welcoming the collision of two of Australasian sports highest- profile stars, who will meet in the midfield for the first time in Saturday's Bledisloe Cup Test in Yokohama. It's their fifth rugby union start against each other but Folau has always previously been fullback for the Wallabies and Williams at inside centre for the All Blacks. It's been that same dynamic in Super Rugby, and their only two rugby league showdowns pitted Williams in the second row against Folau out wide - when the Bulldogs met Melbourne in 2007 and an Anzac Test the following year. 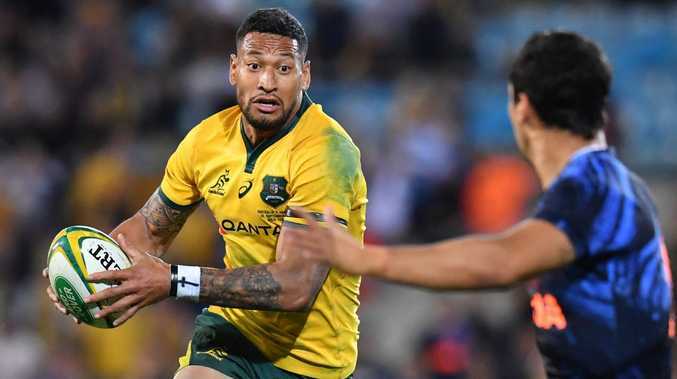 Folau has found himself on the wing in recent times but injuries have coach Michael Cheika gambling by throwing him into the unfamiliar position of outside centre this week in the hopes of sparking the Wallabies' stuttering attack and preventing a 3-0 clean sweep by the men in black. Folau’s positional switch will put him closer to SBW. Williams expects him to be a handful wearing the No.13 jersey. "He pops up everywhere. He might be carrying more off set piece but he does that from wing as well," Williams said. "He's a quality player, a world-class player and he'll fit in anywhere." The pair share more than outrageous talent. Off the field, their personas have been bigger than the game at times, attracting ardent fans and critics in equal numbers. Both have become devoutly religious, with Folau finding himself castigated earlier this year for expressing anti-gay beliefs. Williams, 33, didn't go near criticising his 29-year-old counterpart when asked to assess Folau's veering away from the mainstream path. "Firstly, congratulations to Izzy. He's come a long way and really done well for the Australian Rugby Union," Williams said. "You always like seeing other Pacific Islanders doing well in what they do. For me, you just find your purpose and go with it. And try to be a positive person. That's how I try and operate." Williams will earn his 50th cap on Saturday and Folau his 70th. It says something about the teams' fortunes that the Kiwi star has won 45 of his Tests and Folau just 32. Wallabies coach Michael Cheika doesn't expect Folau to spend much time defending Williams and preventing his trademark offload. That task is likely to fall on Kurtley Beale, one place further in. "When Williams gets going and he can get his arms free he's pretty difficult to stop," Cheika said. "But I think they'll be challenging the little blokes more than Izzy and I back Beale."